Anemia is a decrease in the tot amoont o reid bluid cells (RBCs) or haemoglobin in the bluid, or a lawered abeelity o the bluid tae cairy oxygen. ↑ 1.0 1.1 1.2 Janz TG, Johnson RL, Rubenstein SD (November 2013). 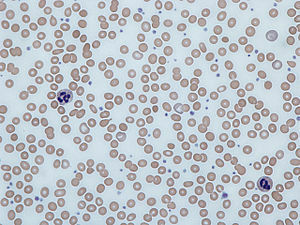 "Anemia in the emergency department: evaluation and treatment". Emergency Medicine Practice. 15 (11): 1–15; quiz 15–6. PMID 24716235. Archived frae the oreeginal on 2016-10-18. ↑ GBD 2015 Disease and Injury Incidence and Prevalence Collaborators (October 2016). "Global, regional, and national incidence, prevalence, and years lived with disability for 310 diseases and injuries, 1990-2015: a systematic analysis for the Global Burden of Disease Study 2015". Lancet. 388 (10053): 1545–1602. doi:10.1016/S0140-6736(16)31678-6. PMC 5055577  . PMID 27733282. ↑ "What Is Anemia? – NHLBI, NIH". www.nhlbi.nih.gov. Archived frae the oreeginal on 2016-01-20. Retrieved 2016-01-31. ↑ Stedman's medical Dictionary (28th ed.). Philadelphia: Lippincott Williams & Wilkins. 2006. p. Anemia. ISBN 978-0-7817-3390-8. ↑ Rodak BF (2007). Hematology : clinical principles and applications (3rd ed.). Philadelphia: Saunders. p. 220. ISBN 978-1-4160-3006-5. Archived frae the oreeginal on 2016-04-25. This page wis last eeditit on 12 Februar 2018, at 22:02.